This month Bracha cooked solo as Uri is off traveling with his lovely wife – and she did a wonderful job as usual. My favorite dish of the night was the corn gnocchi served on a puree of lamb bacon and greens topped with a sous vide egg – excellent stuff! My thanks to Andy Sinton who graciously hosted us – and got to keep all of the leftovers. Wine-wise there were some highs and some lows this month for me. Also – we had a record 5 bonus bottles brought by well intentioned diners, but the overall feeling is that this takes away from the featured wines that everyone is bringing and so a new rule is being instituted in that no one may bring a bonus bottle without prior approval – and then it will only be allowed if it is of special interest or because it happens to work really well with the planned menu.Also, the smells coming out of the kitchen were AWESOME – but I really couldn’t get a good read on the nose of each wine, so I decided to omit those notes. Now on to the wines. Ella Valley, Ever Red, Blanc, 2016 (Bonus Bottle) – Tasted blind. Unfortunately bottle was DOA. Amos Winery, Mont Blan, 2017 (Bonus Bottle) – Tasted blind. I liked this wine when I tasted it back in NY in March. This time it was served way to warm to really show to its full potential. Didn’t show badly, but could have been much better. Domaine Ventura, Grand Vin, Merlot, 2006 (Bonus Bottle) – Tasted blind. What can I say here. This wine was not dead – but it simply was not a good wine. It likely wasn’t the best bottle to begin with – and aging didn’t help at all. Domaine Netofa 2017 (Bonus Bottle) – Tasted blind. Also just released. This wine is still way too young to really be enjoyed. All of that typical Netofa bitterness that so many people find-off putting is really prominently on display on the finish. This will almost surely recede over the next 6 months. I didn’t mind it – but for most others it was overpowering. In any event, I would probably stay away until this is more ready. ElviWines, Herenza, Rioja Crianza, 2010 – Wine showed much greener than the 2008, with less earthy notes. Crazy sweet herbs and grass and tons of fresh juicy berries. Also still very young and not near peak with plenty of tannin and good acid. Really nice bottle. 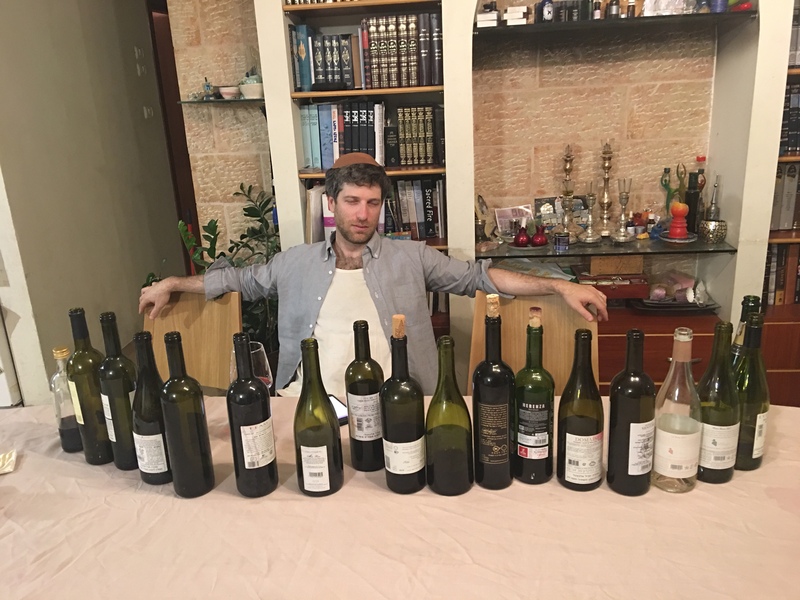 Golan Heights Winery, Yarden, Katzrin, 2000 – While there are some reports of this bottle being over the hill, that was simply not the case with this particular bottle. In fine shape – and I would think it could hold for a good few years yet. Up front ther is some very ripe but not overpowering red berry with warm spice and bit of nice earthiness. Tannin is well integrated but still present. Impressive showing for this 18 year old bottle! Mia Luce, Rosso, 2009 – This was the first wine released under the Mia Luce label by Kobi Arbiv – and the only one made primarily of Merlot (96% – with remainder Carignan) . This was my first (and likely only) time tasting this wine. The wine was a bit divisive around the table. For those of us who don’t mind brett – and I don’t – the nose was very nice with barnyard and some meat. For me the barnyard was not at all overpowering and added to the experience. For others it was a deal breaker. In the mouth there was nice earth and tobacco with some dark fruit. Acid is in the background and tannin is very well integrated and silky. This wine isn’t getting any better (and I would guess is probably slightly past peak) so if you are lucky enough to be holding, go ahead and drink up. Galil Mountain, Yiron, 2011 -Showing very nicely and likely at peak. Rich dark fruit. Warm spice and roasted meat and herb and some nice earthiness. Tannin and acid have both receded a bit. Very nice bottle. Doubt it’s getting any better, time to drink. Yatir, Petit Verdot, 2012 – I usually enjoy Yatir’s PV, but I wasn’t feelin’ this one. Presented as a very entry level PV – none of that rich warm spice or complex fruit profile found in other vintages. Also there was a really weird metallic/coppery note on the finish that I found very off-putting. It’s a pass for me. Mia Luce, Rosso, 2012 – So there has been crazy bottle variation with this wine. Luckily, this one was in good shape. Dark fruit, good warm spice, roasted meat in the mouth with a bit of menthol on the finish. Great acid and tongue coating tannin – this bottle showed perfectly. But it’s important for me to note. I have had this bottle 7 time sin the last year and half – this is only the 3rd time that it has really lived up to expectations. While a .428 batting percentage is wonderful in baseball, it’s sort of sucky in wine…. Flam, Reserve, Cabernet Sauvignon, 2011 – no real change from my last tasting at the winery a week ago. I am a big fan…. Yaacov Oryah, Iberian Dream, Reserva, 2011 (incorrectly marked Gran Reserva on the Menu) – So I know that Yaacov himself thinks this is superior and has longer aging potential than the Gran Reserva. While nice, I happen to really prefer the Gran Reserva to this wine. Still, this wine is very nice – showing nice ripe dark fruit, dark chocolate and a hint of earth. Great stuff. Carmel, Mediterranean, 2011 – No change from the last times we have had it. This continues to be an excellent vintage of this interesting blend – and one of the few that I really like. Super balanced and well made and in my top 3 for the night. Carmel, Single Vineyard, Kayoumi, Shiraz, 2012 – Not sure if this wine is simply inferior to the great 2011 or it’s simply too young (it did spend 3.5 hours in the decanter though). It was relatively closed – but what I could squeeze out of it wasn’t overly impressive. Need to try in another year or two. Four Gates, Frere Robaire, 2012 – Way, way, way too young. It was decanted for about 4 hours in total and was open for a good 4 hours before that. Was almost impenetrable and only barely started opening up with layers of rich fruit. So I let it sit and sit and sit and kept my glass until we had almost finished cleaning up – and after another hour plus, the wine was showing nicely. Still layers of rich red ripe fruit but also some beautiful herbs, and earthy mushrooms. I hope I get the opportunity to taste this wine again sometime – maybe in five years or so when it should be hitting its full stride. Still, even at this stage it is hard to miss what a powerhouse this wine is. Domaine Herzberg, Aramis, 2012 – So I know that I was in the minority here, but I liked this wine. It is a fortified desert wine made of 100% Malbec and coming in at 19.5% ABV. What I liked about it is that it had none of the raisiny notes one often gets with Israeli port-style wines – this was all dark chocolate with a creamy moth feel. Yes, it was lacking in acid. And it had a note of something like a baked pastry which is uncommon – but I thought it worked with the rest of the profile. I am reasonably sure I was in the minority though. The one place lacking was in the Acid – which I remember being much more present last time I had it – but overall I was fine with this. But I would say only about 1/3 of the people there cared for it.